Fill out our simple form and get quotes from local Body Artists. Body art is an increasingly popular addition to any event, regardless of the occasion. Suitable for children and adults alike, body art is a fantastic way to add some sparkle and wow factor to an event. Ranging from small designs to impressively intricate full body art, suppliers often offer a range of body art depending on the theme. For more information about hiring a body artist for an event, submit a request from today and hear back from suitable suppliers. Tash Face Painting is a London based face/body painting and glitter service, that provides unique, meticulous and extravagant experiences for all events. Bespoke face and body art services for a wide range of events. Hire body painted performers for boutique events, parties and weddings. Get painted for shows, festivals, parties, photoshoots etc. Specialising in Baby Bump Art for the soon to be mum - Painting a bump image of your choosing to celebrate the forthcoming baby. Ideal for a special memento or maybe a baby shower pressie idea. I provide partial or full body painting for adults with or without modesty covers. I also offer eco glitters, facial and body bling, as well as UV reactive/neon paints for use under black lighting. Common types of body art include festival face paints and glitter hair, stencil designs (ideal for corporate events), UV body art, airbrush henna, removable tattoos and of course one of a kind body designs. 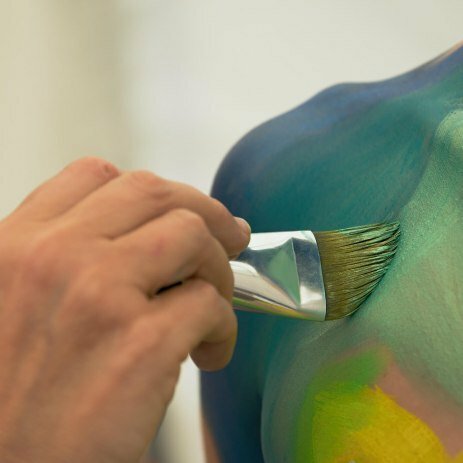 Depending on the required service, body artists are most often able to set up in or outside (weather permitting), making it the perfect addition to festivals, fetes and fundraisers. To find out more about hiring body art for an event, simply submit a quote request.